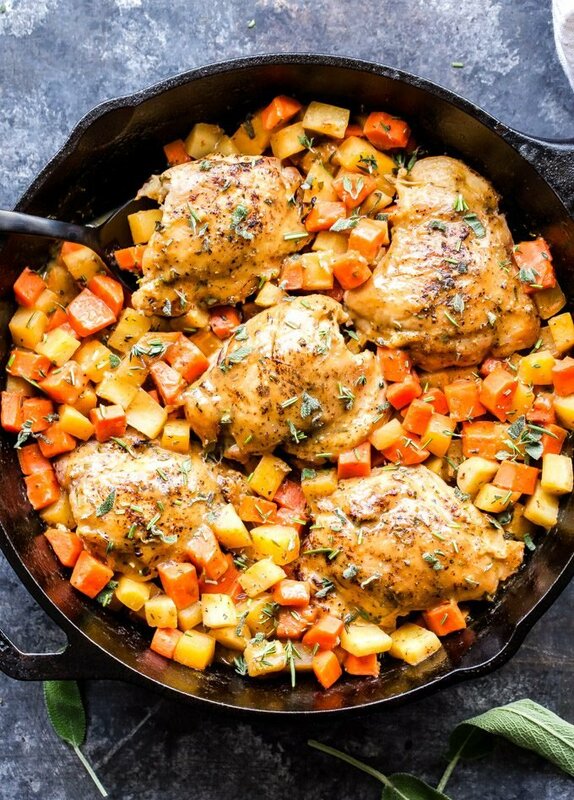 Apricot Chicken Thighs with Root Vegetables is a hearty and easy to make one skillet dinner. Savory with a hint of sweetness from the apricot jam, it’s healthy comfort food at it’s finest! We’re almost two weeks into the new year, how are those New Year’s resolutions going? I’m hoping you haven’t given up on them already. I only made a couple resolutions this year because I know the more I make, the less likely I am to keep them all. One of them was to cut back on desserts and stealing bites of my husband’s not so healthy weekend lunches. Unlike me, my husband isn’t what you would call health conscious when it comes to food. Crispy fried chicken with a side of fries or a cheesy chicken quesadilla is a weekend recurrence at our house and it’s so hard for me to resist sneaking a couple bites. Between those bites and too many sweets during the week, I’ve decided enough is enough and it’s time to get my act together. One way I’ve been resisting his weekend lunches is to make sure I have a delicious one for myself and one that will fill me up. I used to just have a small salad with part of a chicken breast, but always found myself hungry afterwards. Now, I’m finding that if I have leftovers from dinner the night before, I’m more satisfied. 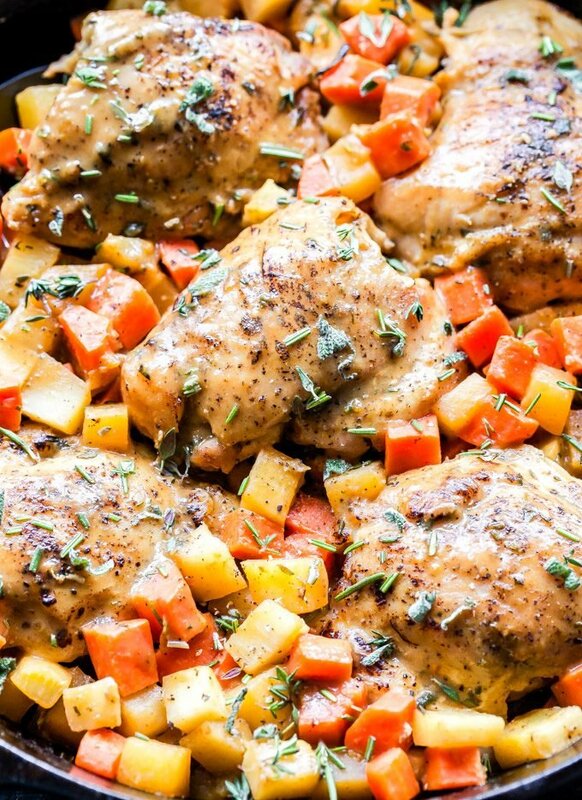 I was particularly satisfied and full after having these Apricot Chicken Thighs with Root Vegetables last weekend. Who needs greasy French fries with no nutritional value whatsoever when you can have a plate of sweet, savory, vitamin packed root vegetables?! I also didn’t feel the need to grab a piece of his chicken, when I had a meaty, juicy, chicken thigh of my own and one that wasn’t covered in batter and deep fried. Let’s talk about chicken thighs for a minute. They tend to get a bad reputation because people think they are much fattier and higher in calories than a chicken breast. In reality a boneless skinless chicken thigh only has an extra 40 calories and 7.5 grams of fat more per serving compared to a chicken breast. That extra bit of fat is what is going to keep you full longer too. 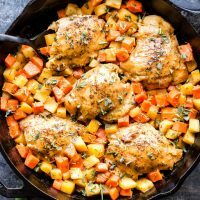 When I buy chicken thighs, my brand of choice is Just BARE Chicken and one package is the perfect size for making these Apricot Chicken Thighs with Root Vegetables. 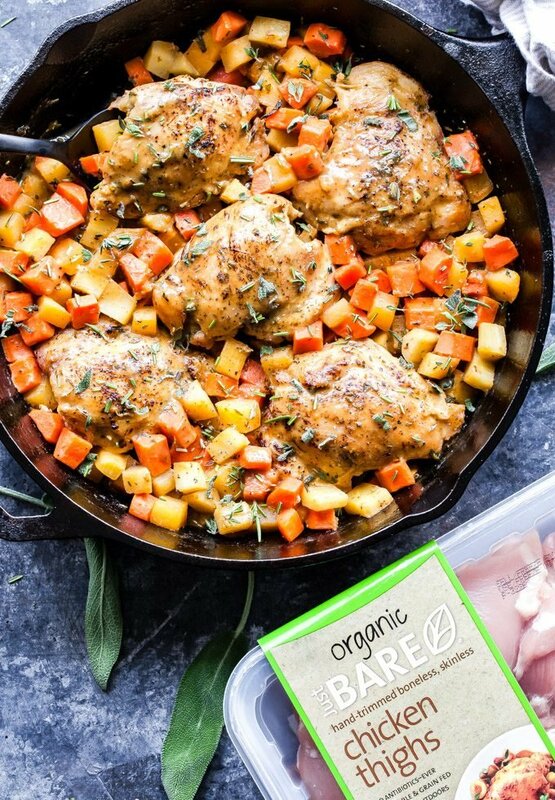 I love that Just BARE Organic Boneless Skinless Chicken Thighs are hand trimmed of any unwanted fat so I don’t have to deal with the extra work and I also appreciate knowing that their chickens are vegetable and grain fed and are raised with no antibiotics – ever. 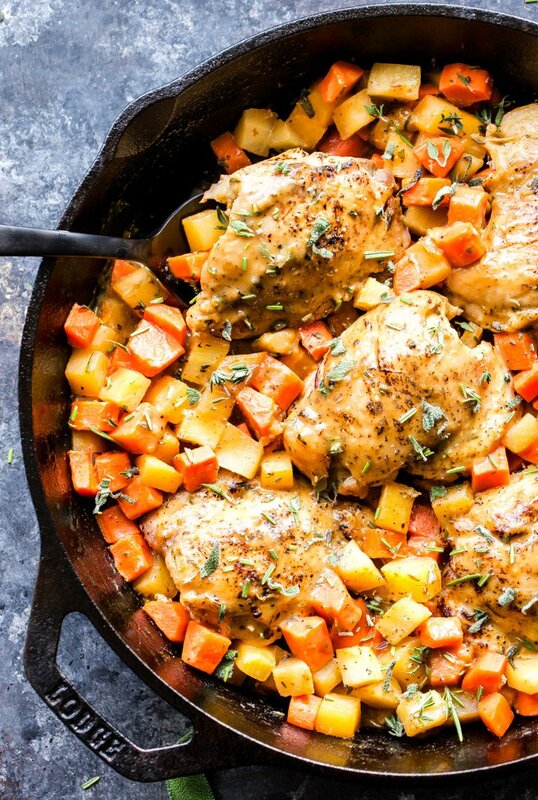 The flavor of this easy skillet dinner is mostly savory with a little sweetness from the apricot jam that’s in the sauce and the natural sweetness from the carrots. 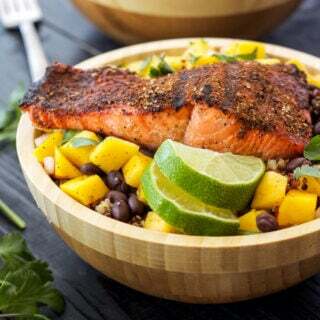 The Dijon mustard adds a nice tangy flavor and the fresh herbs bring everything together. 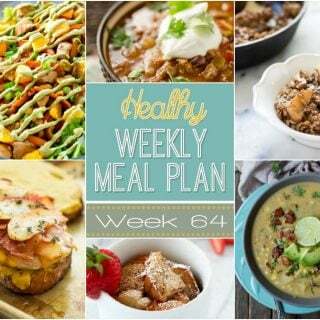 I’m looking forward to making it again later this week to avoid the weekend lunch temptation and sticking to my resolution. Enjoy! Heat the olive oil in a large skillet over medium-high heat. Season the chicken thighs with salt and pepper then add them to the hot skillet. Cook approximately 3-4 minutes per side or until golden brown. The chicken won’t be fully cooked at this point. Remove the chicken from the skillet and onto a plate. Whisk together the chicken broth, apricot preserves and Dijon in a small bowl and set aside. Add the carrots, parsnips and rutabaga to the skillet, season with salt and pepper and sauté 4-5 minutes. Add in the herbs and garlic and sauté another minute. Add the chicken back into the skillet and pour in the apricot mixture. Reduce the heat to medium, cover with a lid or piece of foil and cook for another 7-8 minutes or until the chicken is cooked through. Once the chicken is cooked, taste for seasoning and spoon some of the sauce over the chicken thighs. 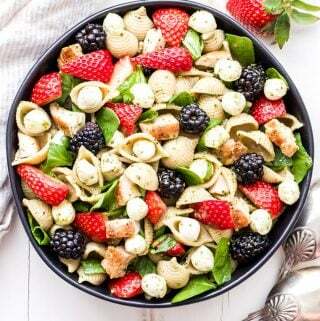 Garnish with more fresh herbs then serve. Feel free to use whatever mix of root vegetables that you prefer.